1-9-06 – Here it is, comrades… my attempt at a single feature article that discusses pretty much EVERYTHING you should think about if attempting to landscape your yard. 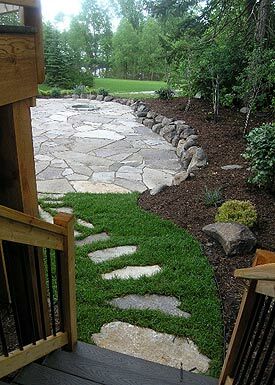 Plenty of pictures, sidebars – even tips on hiring and working with a landscaper if D-I-Y is N-F-Y (not for you). I’ll leave this one up for a good month, and see you with the next update on February 9. A pleasing residential landscape is more than a collection of trees, shrubs, flowers and lawn. “Form ever follows function,” American architect Louis Henry Sullivan (1856-1924) reminds us, and he could well have been speaking about landscape design. Most homeowners – and an unsettling number of landscape architects – allow the plants to get in the way of good landscape design. 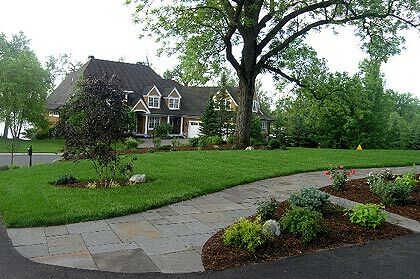 When planning the landscaping that will surround your home, the first step is to develop a clear, separate sense of each of the four factors that impact landscape design, and to dwell on them in this order: function, maintenance, cost, and finally, visual impact. Let’s stroll through these four design factors under the assumption that you will be doing all the work, from planning to planting. Toward the end I’ll point out some of the important considerations to keep in mind if you’d rather hire a professional landscaping firm. But please don’t skip ahead if you know already that you’d rather a trained expert slice your cable TV wire with a power tiller, rather than slicing it yourself. A solid understanding of basic landscape design principles on the part of the homeowner is important regardless of who does the work. Consider function first. Ask yourself what purpose you’d like your property’s landscape to serve. Careful, this is a trick question; one’s initial response tends to be along the lines of, “I want it to be beautiful,” or, “I want a colorful cottage garden like my grandmother’s.” You’re getting ahead of the game. Landscaping is not art. It needs to let the rain in. And it needs to allow the dog out, keep the kids safe and in view, handle traffic of family and guests, shield against bitter winter winds, give Tucker room to play catch and Emily room to kick a soccer ball, all while blocking old man Johnson’s twenty two-foot, blue-tarped RV from the view out the master bedroom. In other words, your landscape needs to serve you, your family, and your family’s lifestyle. Do you own pets? Cats that are allowed outside are never much of a design consideration. The minor nuisance created by cats using the sandbox as a litter box is greatly compensated for by their diligence in keeping the rabbit population in check. Fido, however, is another matter. For dogs, a fence is usually required, be it a physical structure, or electronic, “invisible” system. Either way, the designated dog area should only include that portion of the landscape that you don’t mind being utterly abused by a dog. Canine destruction of expensive shrubbery, flowerbeds, or the vegetable patch is not a case of a bad dog, but of bad design. For small dogs, a fifty to eighty square-foot pen might serve just as well as granting free reign of the back yard. But again, think about its functionality – hiding a dog pen behind shrubs sixty feet from the house is good design on sunny summer days, but not so smart in winter, or April’s muddy monsoon season. Better to tuck it alongside the garage or near a back door, screening it with tall shrubs. How many children in the household? If the answer is none, will that change in a few years? If you’re planning on starting a family, and bought a house with that future in mind, apply the same clairvoyance to your landscape design. Swing sets, trampolines, slides and sandboxes take up a fair amount of space, and it’s far wiser to plan for these items at the start, rather than attempting to crowbar them in later on. Most important is to design for children’s safety. Toddlers toddle, an adorable behavior to witness, yet terrifying when their toddling takes them clean out of sight. Play areas need to be designed away from roads, driveways, creeks, ponds and swimming pools, and incorporate fencing, walls or plantings that dictate containment. A play area should be supremely visible from inside the home, so you can keep an eye on the little rascals through the windows of the room you are most often in. Your landscape will carry traffic. Primary sidewalks need to be wide enough to allow two people to walk effortlessly side-by-side, meaning a minimum four-foot width. Primary sidewalks and secondary pathways need to lead the feet where they would naturally choose to go, were there no clues given. Unplanned, dirt pathways carved out by pedestrians searching for a shortcut through the ghastly landscaping surrounding malls and other retail properties serve to show the designer where a pathway should have been installed in the first place. Don’t make the same mistake around your home. Length of the sidewalk and scale of the house will further impact its width. 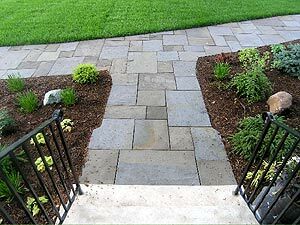 A sidewalk meandering more than thirty feet as it leads to the front door of a large, two-story house will look too narrow at the four-foot width; a width of five feet will be more in scale, and six feet may look even better. Will your landscape include a patio? It should. Designing inviting, comfortable areas that serve as outdoor living space is one of today’s hottest landscaping trends. Cooking, eating, entertaining, reading – even paying the bills – are all activities made more pleasant if conducted outdoors (in spring, summer and fall, at any rate). What’s the average number of guests you’ll invite to a backyard barbecue, book club meeting, or Friday night Texas Hold’em marathon? The size of your patio is dictated by its range of function, as is its location in the landscape. Most often, a patio belongs in the back yard (peace and privacy) in close proximity to the kitchen (food and drink) accessed via a wide, sliding glass door (food and drink being carried by you on a big tray). 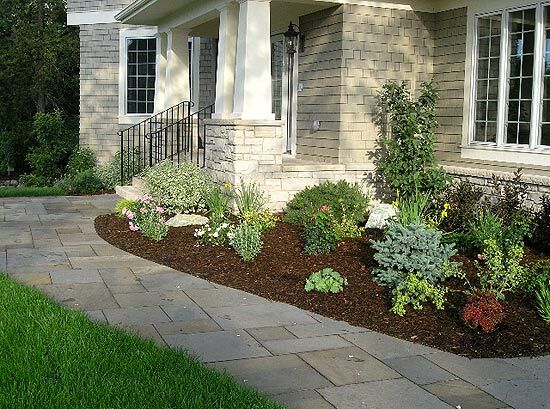 Understand that paved surfaces are as much a part of your landscape as the lawn and planting beds. You need a driveway that makes it easy to maneuver vehicles. Backing your car down the driveway and out into the street is exciting at first, but grows tiresome after ten years. If space allows, your landscape needs a wide garage apron, or special extension, that enables you to back out of the garage, turn, and pull forward down your driveway. Driveways in older properties that seem to possess this feature, except in inadequate scale, serve to remind us that our vehicles have grown longer. An expansion may be called for. The amount of space devoted to lawn should also be based on function. When children are part of the equation, lawn space may be of utmost importance, and should be of a size and configuration to support activities involving nets, racquets, hoops, mallets and balls of all shapes and sizes. But don’t exceed the equation of two-thirds lawn, one-third plantings. When lawn encompasses more than two-thirds of the total property, the potential for creating any degree of charm, majesty, or beauty throughout the landscape withers away. And if any portion of the yard contains more than a gentle slope – if it’s what can fairly be called a hill – why cover it with grass? A hilly side yard is not where you set up the croquet set, or pass the football around. Don’t be suckered into thinking that lawn belongs somewhere on all four sides of your house. Hills, shady areas and narrow side yards are best landscaped with trees, shrubs and perennials, their function the beautification of that portion of the landscape, and the nestling of the house. A small, shady backyard can be filled by a stone patio, children’s play area (surfaced by shredded bark), tool shed, compost bin, shade garden and shrub border. What function would thin, dying grass fulfill? Evergreen trees and shrubs planted to muffle highway noise, stifle wind, provide privacy, or block out the view of the tangible embodiments of a neighbor’s lifestyle are classic examples of functional landscape design. So too is the placement of compost bins, storage and potting sheds, which need to be accessible without detracting from the beauty of the landscape . In instances where the home has a well, one must consider the use of hinged or removable sections of fencing in addition to landscape plantings to allow access for a big, wide truck on the inevitable day that your well needs service or deeper drilling. And a gate in a picket fence needs to be wide enough to permit passage of your biggest wheelbarrow, or brand-new rider mower. Your property serves many functions. A good design results in a landscape that works and plays with you, not against you. Factoring maintenance also begins by answering questions, such as how much time do you wish to devote to maintaining every aspect of your landscape? Weekly maintenance involves watering, mowing, sweeping, and deadheading of annuals and perennials. Monthly chores include fertilizing, pruning, shearing, raking and turning of a compost pile, although for some of these tasks, activity every two to three months may be all that is needed. Do you love gardening, or consider all of it a necessary evil? Now is the time to decide if weekly watering (yes, weekly) of newly planted trees, shrubs and perennials is something you look forward to (I am rarely as happy as when standing deep in thought, watering shrubs) or something you struggle to incorporate into your Saturday. I probably spend 20 hours per week gardening, but that’s what it takes to keep me sane and off the police blotters. Your design can serve either end of this spectrum, and all timeframes in between. Mulching around plantings saves watering time. Shredded hardwood, cedar, or cypress is the only choice for mulching tree and shrub plantings. Do not use a landscape fabric/weed barrier under wood mulch, as it blocks the natural decomposition into the soil, and in heavy rain floats mulch placed on an incline down the slope. Three inches of wood mulch will block all weeds. Weeds that appear in later years are from wind-blown seeds, and are easy to pull. A three-inch layer of shredded hardwood mulch will need replenishing about every three years; cedar holds up about a year longer, and shredded cypress lasts longest. Never install black or clear plastic on the ground underneath mulch, as it suffocates and kills the soil beneath. “Decorative” rock mulch is also the kiss of death. In addition to looking unnatural, it heats up in sun and keeps the soil around plants too warm for comfort. For more on this topic, refer to my article The Shredded Truth. Anything placed in the lawn increases maintenance time. Mowing around the feet of a swing set means coming back later with a hand clipper or string trimmer. The same goes for the practice of circling trees in the lawn with bricks, large stones, or concrete block. It not only annexes the tree from the landscape and makes it look stupid, you can’t mow cleanly around the tree edging. Highly suggested reading: The Astonishing Truth Behind Tree Circles. Even a large, lavish landscape can be maintained with a relatively meager investment of time, but know this: The only way to have a maintenance-free landscape is to hire a weekly gardening service to perform all duties. If that’s an affordable option, consider it. If not, the single greatest timesaving investment you can make is to install an irrigation system. On average, once a landscape is finished, about sixty percent of your maintenance time is spent watering. Irrigation is not an unthinkable do-it-yourself project. The parts, instructions and expertise are all available on-line and at your garden centers. Nonetheless, hiring an irrigation contractor is wise. Professionals will always create an irrigation system that is superior, and they’ll do it quickly. Either way, if you want to irrigate both your lawn and tree and shrub plantings, be aware that you can’t run one system. You’ll need several, of different types. Pop-up heads work well for lawns, but are not suitable for perennials, trees and shrubs (all that splashing water on the trunks and foliage encourages fungal disease). 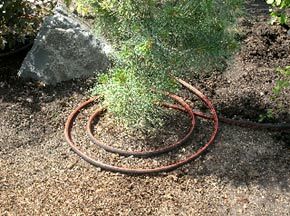 The irrigation around your flowers, trees and shrubs should be a drip or soaker hose system that runs at ground level, below the mulch. It will need to be on a different timer system so that it waters your plants less frequently, but deeper than the lawn system. As a general rule of thumb, for your typical landscape – trees, shrubs, lawn, perennial and annual flowers – with no irrigation system, figure three hours of weekly maintenance per one-quarter acre. Additional landscape features such as water gardens, container plantings, and specialty plants such as fruit trees will increase the amount of maintenance time. Your budget for landscaping may well be the most important factor dictating how your project proceeds. And it is very important to set a budget, a firm, realistic dollar figure of how much you are willing to spend. The tendency of most do-it-yourself homeowners is to spend money for landscaping in fits and starts, a little here, a little there, spread across the years. The problem is this tends to abet creation of a disjointed, dysfunctional landscape that never pulls together as a cohesive whole. If you hate your front yard, if the landscaping is old, inadequate, or nonexistent, with a lawn in dire need of revitalization or replacement, bite that whole chunk off, from a monetary standpoint. Create a plan (tips on doing so come next) that enables you to budget for the cost of new shrubs, perennials, hardscapes and lawn. Now go out and tackle the front yard. If the job stretches into a few stages spanning a few years, that’s OK. What you complete in the middle stage of the project will always fit in with what you’ve already completed, and with the portion of the work to come. Don’t forget to figure in something for old tree and shrub disposal, and for additional soil, soil additives, fertilizers, possibly irrigation, and mulch. Also estimate your time – what is it worth? 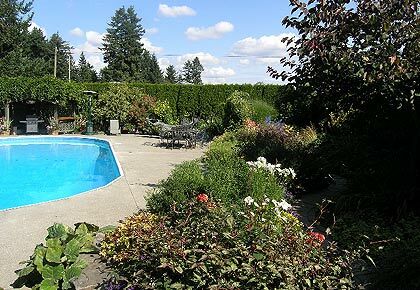 You may decide that it’s wisest to hire a landscaper for certain portions of the project. After giving due consideration to everything described above, you can begin to develop a landscape plan. The best news is that contrary to everything you’ve heard and read, you do not need to draw this plan on paper. The reason a landscaper has a designer draw a plan for every project is that the plan needs to be handed over to a foreman, a non-designer who shows up with a crew to install your landscape. After measuring and an initial consultation, the designer may never set foot on your property again. The foreman needs a plan to tell him where the retaining wall goes, where the trees and shrubs are to be planted, what shape and size to make the patio, and where to place the perennials. Unlike the designer, or landscape foreman, you live on the property. You’re able to walk it every day, and to look out every window, week after week. Aided by clippings of pictures from magazines, visits to landscapes you admire, thorough investigation of the nooks and crannies of this website, and your plant research at nurseries and online, you will be able to start visualizing your landscape. I’m dead serious. This is not some rare, Zen-like skill. You don’t need computer design programs or special equipment. All you need is gumption, old garden hoses (or a few hundred feet of rope), some wood stakes, and a hammer. You first step is to envision, then define, the main lines of your landscape. These are the lines that define the edges, or perimeters, of the various functional parts of the landscape. They are called “concept lines.” Concept lines are the most important factor in creating a visually impressive landscape. You don’t need to draw them on paper because you will “draw” them with old, supple garden hoses (or limp rope) right on the very ground you aim to landscape. Let’s say you want shrubs and small trees to surround the house, and that within this shrub bed you envision smaller beds filled with flowers. In the front, you’d like the lawn to run right up to the shrubs that flow from the house (called a “foundation bed”). Outline this bed using hoses/ropes. You can adjust either by hand, nudging and tweaking the line, softening curves, creating more depth at the corners, until, stepping back (and maybe studying it for a few days), you have the shape of your foundation bed(s) exactly where you like it. You’ve just created your landscapes’ key concept lines. The secondary line you may create within this bed, the one that defines the perennial flowerbed within the shrub planting, is not a concept line. When the landscape is installed, the shape of this perennial bed, and the perennials themselves, will act as a focal point, a nice accent, but the eye will initially be drawn to, and follow, the concept line. Concept lines and secondary lines look best when they curve. Sure, there are exceptions; if a formal look is what you’re after, garden beds with straight lines may fit the bill. We photographed a killer St. Paul garden for Better Homes and Gardens a few years ago where in the back yard, the straight-line house design, thrusting, square shape of a dominant conservatory, and rectangular shape of the adjoining patio dictated straight lines for the back yard garden beds that faced it all, separated by a fifteen-foot patch of lawn (sorry, not allowed to use the photos). In the front yard, the foundation beds curve. The homeowner had attempted curving garden beds in the back yard, but a straight-line edge looked better. However, for most residential landscapes, even though your house footprint is nearly always made up of straight lines with ninety degree angles, giving broad, sweeping curves to the beds, the lawn edge, the sidewalks, patios and pathways, will ensure the best visual results. Where lawn ends, and anything else begins, you’ll always have a highly visible concept line. If it’s a straight run of fence, the fence becomes a prominent concept line – and straight makes for boring. Instead, lay a hose down alongside the fence and create a long, serpentine bed line, six feet away from the fence at the start, curving inward to perhaps four feet, then curving outward to ten, back to seven, then out to twelve, or fourteen. Tweak the line until it meanders like a river. Perhaps at some point it curves out and incorporates a mature tree that is nearby. Fill this area with a mixture of evergreen and deciduous shrubs, add perennials and annuals if you’d like, to create a naturalized, curving swath. Now run the lawn up to that. The line between lawn and shrub bed becomes the dominant concept line, the fence becomes a secondary accent, and – this is the cool part – the straight line created by the fence disappears. As you begin to establish your landscape’s concept lines as defined by hoses or ropes, smaller spaces will appear. 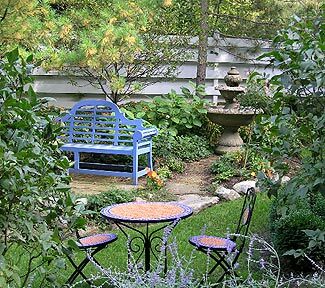 The perfect spot for a garden bench, birdbath, sculpture, fountain, container grouping, cottage garden, or swath of annuals are most often found within the beds outlined by the concept lines. Don’t place a birdbath, bench, or swing set out in the middle of the lawn; tuck them in so they are just inside the concept line in that area of yard. The same goes for compost bins, dog kennels and vegetable patches, which might be placed deeper in. Think in terms of continuous flow. Use another hose or rope to define patio spaces (or stakes, if it’s square or rectangular) and ponds. Drive stakes to mark the corners for compost bins, utility sheds, or the back corners of a child’s play area (the front edge will probably be a curving concept line). Use contractors spray paint, available at hardware stores, to paint in pathways, sidewalks, and anything involving excavation. A final, more advanced design tip: Your concept line need not always be a physical edge defining a planting bed. Maybe that line ends, or tails off, but is picked up several feet away by a curved planting of trees and shrubs. The eye will carry along the total line, even if there are physical gaps. After you’ve laid out the landscape, you can think about what plants to use. You now know the widths of the undulating beds surrounding your house, bordering lawn, softening the fence, and muting the harsh corners of your back yard. Select and plant shrubs and trees that will grow up and fill these spaces, keeping their mature width and height in mind. You’ll also discover that some of the plants you had your heart set on are going to fit, but not where you initially intended. You’ve studied your yard and know which areas are in sun, and which are in shade. Colorful shrub roses require full sun, so they’re not going to work up close to the shady front of the house. But you can place them over there, on the south side, along the patio. Change your concept lines if you need to – move the hose – to make certain the plants fit. If space constraints dictate that a particular tree you’d like to use is simply going to grow too wide, no matter what you do with the concept line, choose a narrower, smaller tree. 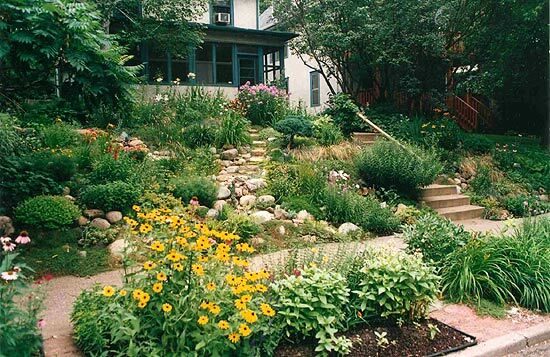 There are ample resources available to help homeowners create brilliant landscapes. People have written books on the subject, and several are quite good. The Ultimate Garden Designer by English designer Tim Newbury is outstanding, with direct prose and hundreds of photos and designs clearly illuminating the best design principles (though I note one plan showing a swing set placed smack in the middle of the lawn). 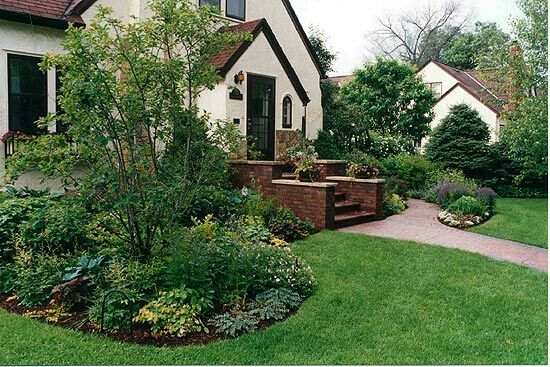 Ortho’s Landscape Plans is a collection of over 100 colored landscape plans by accomplished designers from around the country, showing use of clear concept lines and pleasing placement of garden features and accessories. Yes of course, other sites on the Internet offer tons of information on landscape design, some of it good, much of it ghastly. Do your own searches – start with “landscape design” – and try to find sites with lots of picture that seem to jibe with the information I’ve given you above. Ask for an on-site consultation, then study how the representative treats you, and what questions he or she asks. Are they more interested in your budget than in your lifestyle, your needs, concerns, questions and ideas? This person should ask about family members, pets, your gardening interests, lifestyle, weekend activities, and how long you plan to own your home. If you’re dealing with a firm interested only in plunking in a cookie-cutter design that lacks character and functionality, you’ll know. Some landscapers will charge for consultations, and that’s not a bad sign. I know one landscaper who charges $1,000 before he even pulls his Escalade into your driveway. He also happens to be a superb landscaper, a true master, with great referrals, and he’s not interested in small jobs. A fee for a consultation will often be credited toward the final bill. Ask to see pictures of the landscaper’s work, and study them. Can you see the concept lines, does the company’s work turn you on? Ask for some referrals of past clients who contracted for a similar job, THEN CALL THEM. Call at least two. If past clients had a positive experience, it’s a great sign that you will, too. Landscapers rarely turn it on, then turn it off; if you average out the satisfaction level of two past clients, you have a very good read on how the landscaper conducts business. 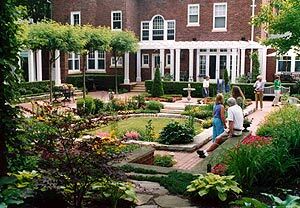 MNLA Membership – Every state has a nursery and landscape association, and Minnesota’s is one of the best. The MNLA provides superb continuing education classes and is responsible for much of the certification standards in the industry. Hiring a firm that belongs to the MNLA (or your state or province’s similar association) is not a guarantee that the landscaper does great work, but it tells you that the firm takes the profession seriously.